Each Box contains One Autograph or Relic Card! Look for Juan Soto Rookie Cards and Autographs! Find Ronald Acuna, Jr. and Gleyber Torres Rookie Cards and Real One Autographs! 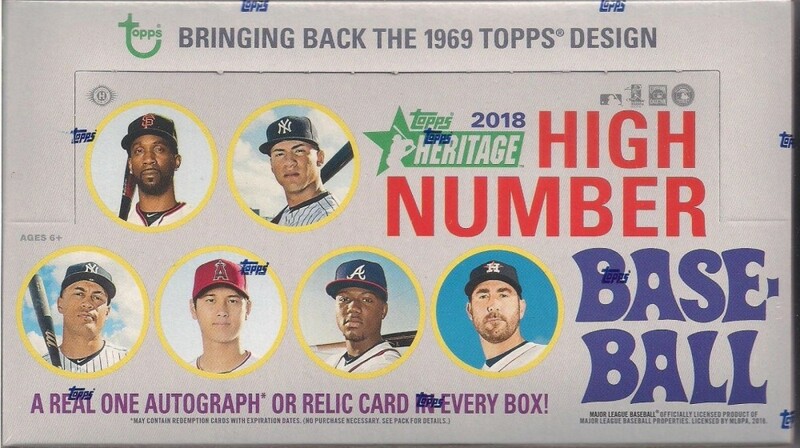 Continue collecting the classic 1969 Topps Baseball design in this year's Topps Heritage High Number Baseball, and complete your set with spectacular rookie call-ups and traded veteran players. 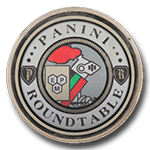 Major highlights of the set will include Real One Autographs, Clubhouse Collection Autograph Relics, and much more! Key Rookies: Shohei Ohtani, Gleyber Torres, Juan Soto, Ronald Acuna, Jr., Miguel Andujar, Ozzie Albies, Rafael Devers, Rhys Hoskins, Victor Robles, Walker Buehler, Austin Meadows, Willy Adames, Scott Kingery, Niko Goodrum, Ryan Yarbrough, Miles Mikolas, Tyler O'Neill, Lourdes Gurriel, Jr., Billy McKinney, Mike Soroka. Picking up where 2018 Heritage left off and numbered 501-725, collect the rookie call-ups and traded veteran players that are essential to complete the set. - MAGENTA BACKS - Limited to 10. - 100TH ANNIVERSARY BACKS - Limited to 25. BASE CARD CHROME VARIATION - Chrome technology with white borders. Sequentially numbered. CLUBHOUSE COLLECTION AUTOGRAPH RELICS: Single uniform and bat relic cards to be signed on card by active and retired players. Hand-numbered to 25. - Autograph Patch Parallel - Hand-numbered 1/1. HOBBY ONLY - NEW! REAL ONE AUTOGRAPHS: Retired and active players sign ON-CARD autographs in blue ink. Select cards will feature players that appeared for the last time on a Topps card in 1969. AMAZIN' METS AUTOGRAPHS: Members of the World Series Champion 1969 New York Mets sign ON-CARD autographs in blue ink. Numbered to 69. NEW! REGGIE JACKSON HIGHLIGHTS AUTOGRAPHS: Autographs will be signed on card in blue ink. Hand-numbered to 5. NEW! CLUBHOUSE COLLECTION RELICS: Single uniform and bat relic cards of active stars. CLUBHOUSE COLLECTION TRIPLE RELIC: Triple uniform and/or bat relic cards featuring players from 1969 matched with a current player from the same franchise. Hand-numbered to 25. CLUBHOUSE COLLECTION QUAD RELIC: Quad uniform and bat relic cards featuring players from 1969 matched with a current player from the same franchise. Hand-numbered to 10. 1969 BASEBALL CUT SIGNATURES: Featuring deceased players from the 1969 set. #'d 1/1. 1969 CELEBRITY CUT SIGNATURES: Featuring musicians and celebrities that were popular or relevant in 1969. #'d 1/1. ROOKIE PERFORMERS: Top rookie players not captured in the first Heritage set. NOW AND THEN: Highlights from the 2017 season and connections to 1969. COMBO CARDS: Featuring two or more players in a single image with a name for the combination. AWARD WINNERS: Cards for each pair of players named 2017 MVP, Cy Young, Rookie of the Year, Manager of the Year, All-Star MVP, and World Series MVP. NEW! MIRACLE OF '69: Highlights of 1969 New York Mets Postseason run and World Series victory. 1969 TOPPS DECKLE EDGE: Reproducing the 1969 Topps Baseball Deckle Edge insert.